Mighty Flip Champs hits the DSiWare service on Monday. We'll it looks like the grueling wait for Wayforward's first DSiWare release is finally over. We just received the press release announcing that Mighty Flip Champs will be released on Monday, June 1st for 800 Nintendo Points. Below is a copy of the official press release that offers a bit more information into the game and how it's played. WayForward, developer of LIT and Shantae, will bring yet another serving of its old-school-flavored punch when it releases Mighty Flip Champs Monday, June 1st 2009 on Nintendo DSiWare™. Playing as Alta, players will “flip” through a virtual stack of maze-laden chambers as they guide their heroine through labyrinthine stages that will challenge even the most seasoned Nintendo DSi™ gamer. 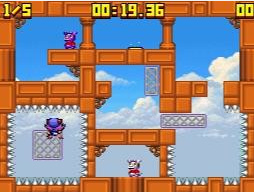 Directed by Shantae creator, Matt Bozon, Mighty Flip Champs continues WayForward’s legacy of creating compelling original IP aimed squarely at gamers that demand modern game design with an old-school zest. Featuring the pixel perfect gameplay gamers expect from WayForward, Mighty Flip Champ has the bite-sized gameplay that complements the Nintendo DSi platform and is perfect for marathon play and speed runs. In Mighty Flip Champs, players control Alta as she warps through a virtual stack of maze-laden chambers that "flip" past like pages of a magical book. Action takes place on the top screen, with the Touch Screen displaying a reflected preview of the next room, and Alta's projected destination within it. When it's time to flip, Alta uses her Magical Warp Wand to replace her world with the next one. Will she land safely on solid ground, or be crushed under it? By cycling endlessly through room after brain busting room, players will match wits with some of the most inspired traps in puzzle/platforming history. We'll have more information on Mighty Flip Champs as it becomes available, as well as a full review early next week. Just as a I predicted. Can't wait to hear impressions! Seriously I might have to get points for this then. Dammit, now I really need to go and buy myself a DSi! I can't wait to get my hands on this one. Corbs how could we know that? AWESOME. I'm gonna add 1000 points to get this! If Pop also happens to come out that day, I may never complain about DSiWare ever again. Real games! Woohoo! My DSi is jumping for joy! Im buying points right now. Hm... now I have to think about buying 1000 points. I'm glad it's finally coming out although I wish it were for 500 Nintendo Points instead of 800. It's not WayForward's fault. If only Nintendo would make the Wii and DSi accounts join as one for some of us that own both hardware. After all they are Nintendo Points...we should be granted the ability to spend them on multiple Nintendo hardware. It's hard to begrudge a premium 800 points price for this really. This is the first original game built up for the DSi in my opinion. I really have high hopes for this. Heck it might even be DSiWare's very own World of Goo! Please be like PiCOPiCT and be released here the following Friday. Awesome, can't wait for this. DSiWare is shaping up to be be better than I expected. Also, I noticed a slight error at the beginning of the article. Not that you need to fix it, I just have urges to point this stuff out. Sorry. "We'll it looks like the grueling wait for Wayforward's first DSiWare release is finally over." It should be well not we'll . Aww man, I don't have any money for points NOOOO!! OH YEAH adding another 1000 points tonight. Im loosing my internet until Monday night sadly cause Im moving. I cant wait now. Finally the wait is almost over. Move in my new house Sunday morning and MFC Monday. AWESOME!!! I swear I'm gonna go to the Dsi shop once I wake up on Monday, stare at the screen and wait until the clock strikes 11:00 (central time)! Hmm, if I buy this, I will still have 500 points! If We Don't Get This Friday To , Im Gonna Be Mad ! Too late wayforward i'm saving my money for something else.MFC should have came out two weeks ago. Yeah I never expected MFC to sell for only 500 Nintendo Points. I just always assumed it would be 800 points. Mighty Flip Champs is easily the best game on the DSiWare service. I saved up my free points for it. I always expected it to be 800 points. In a way, I'm surprised it wasn't more. MFC and Paper Plane are the best 1000 points I didn't have to spend.